Mic-Anthony Hay (@micanthonyhay) is a New York based photographer and filmmaker specializing in adventure, landscape, and travel imaging. The Sony Alpha Imaging Collective member is extremely prolific and always on the move. We caught up with Hay to learn more about the Sony mirrorless cameras and lenses he uses most and the other gear he brings with him on his adventures. I use photography and filmmaking to tell stories of travel and outdoor adventure. Occasionally I have the opportunity to work on really important projects, like a documentary I’m filming that will preserve the memories of Jewish refugees from World War II. I'm a hybrid still and video shooter and I am usually doing both on my travel and outdoor adventure focused trips. Sony α7R III: This is my main camera for photography and cinematography, because of the form factor and incredible quality. While I share most of my photos on social media, my work also demands high-quality images for web and commercial use. The α7R III has a 42.4-megapixel resolution, 15-stops of dynamic range and 14-bit RAW image output give me the very best file to start with. The file size gives me plenty of cropping flexibility in post. 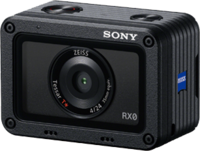 Its 4K footage delivers incredible results for my video work, and with the Sony Z series batteries It can easily handle a day of filming. Sony RX0: I always keep an RX0 in my bag. Its size and shape are deceiving. For me, this isn't an action cam but a sharp, hi-res super camera in a compact rugged casing which allows me to use it anywhere in any weather conditions for unique angles and point of view shots. Now that’s creative freedom! Sony FE 16-35mm f/2.8 G Master: This is my favorite and most used lens for both photo and video. It’s incredibly sharp at all focal lengths and I use it for most of my adventure and landscape shots. The f/2.8 constant aperture is fast enough for astrophotography. When filming a recent documentary, I used it for all of my wide and medium shots including interview footage and B-Roll. I even use it on my Zhiyun Crane 2 stabilizer for a flexible, on-the-go video setup. Sony FE 85mm f/1.4 G Master: The 85mm is a recent addition to my gear bag and it satisfies my needs for the occasional portrait shoot. I also use it paired with my α7R III for my main camera angle when recording interviews in 4K. I also remap the C1 button on my α7R III to APS-C mode and with this lens, that gives me the angle of view that’s equal to a 135mm..
50mm f/1.4: One of my favorite things about using Sony mirrorless cameras, is the ability to adapt vintage glass. Sony Artisan Bob Kirst, who shot with Nikon gear before switching to Sony gifted me this lens. Bob is a long-time National Geographic contributor, so I’m sure this lens has traveled to many countries. I will keep it forever, particularly due to the sentiment and nostalgia. Sony SD cards: I use Sony G series SD cards for their incredible transfer speeds. The last thing I want after a day of shooting gigabytes of 4k video or hundreds of photos is a long export process. These cards are reliable - a critically important quality! Manfrotto Befree Carbon Fiber Tripod: This tripod is always with me because of its lightweight but sturdy build. It allows me to take adventure shots of myself because I trust leaving my cameras on it pretty much anywhere. Joby Gorillapod: My Gorillapod gets a lot of use for both photos and video. I can safely mount my camera on a rail or in a tree to capture a time-lapse or unique video perspective. It also comes in handy when I shot vlogs. Polar Pro Filters: I shoot with a variety of filters for still photography and cinematography. I have a Neutral Density (ND), Circular Polarizer (CP), and Ultraviolet (UV) filter in my bag at all times. Rocket Dust Blower: I use this handy blower the night before, during and after a shoot to make sure I keep dust off my camera sensor and lenses. Peak Design Slide camera strap: This is a must-have for hybrid shooters because it allows you to easily remove your camera straps for use on a gimbal. As a Sony Alpha Collective member, I was lucky enough to get a custom Sony version! Samy’s Microfiber Cloth: This cloth is great for keeping my laptop, camera LCD, and lenses free from smudges. Zhiyun Crane 2: This gimbal suits my needs for travel or documentary filmmaking and helps me capture stable moving shots at numerous angles. As a mirrorless user, it only makes sense to take advantage of a lighter gimbal solution. I usually use a prime lens on my α7R III while using It, but it can even manage my 16-35mm f2.8 G Master. Zoom H5 Recorder: Having good audio in videos is extremely important. I use this recorder to collect ambient sound. It's always with me. Intervalometer/Remote trigger: This remote comes in handy for time lapses with my α7R III and I also sometimes use it to get self-portraits. Think Tank memory card holder: I keep my SD cards protected and organized in this simple Think Tank holder. Black Diamond Headlamp: This headlamp comes in handy when searching for and operating my gear at night or getting creative with astrophotography! 2 TB Lacie Hard drive: I use these drives to back up my photos and videos. I use a thunderbolt version to house my Adobe Lightroom catalog, because of its reliability and read/write speeds. It is very important to me to back up my gear at the end of the day, so I always have at least 3 of these drives with me. MacBook Pro: I’ve been trying to avoid the “dongle life” that comes with the latest MacBook laptops as long as I can, so I have chosen to stick with my 2015 version. It still has the convenient memory card slot that I use to preview or backup my files. When I purchased it, I had extra RAM memory installed so it can handle 4k video editing. Using Final Cut Pro X, I create proxy files of my 4k footage for faster editing. iPhone X, Apple Watch, and Airpods: I like to bring my audience on location with me wherever I go via social media. I use my iPhone to capture the occasional quick BTS photos and videos to share with my audience. It also helps me keep up with emails and flight information on the go. Most importantly it stores my favorite 90s tunes, that keep me inspired on long flights or during editing. Watson Adapter Plug: These adapters were essential for my trip to Norway and Iceland this year. Make sure that you research what adapters you will need for international trips and pack a few of these in your bag, for a quick recharge in a foreign airport or coffee shop! Lowepro ProTactic 450 AW + Freeline Bags: I work closely with Lowepro and I use their Freeline bag to carry and protect my lighter setup. Their ProTactic 450 AW is my go-to bag for outdoor adventure or environments where protecting my equipment from unpredictable weather conditions becomes a priority. DJI Mavic Pro: This drone is light and usually fits in my travel bag for stunning 4k footage and 12-megapixel stills. I always travel with two extra batteries to make sure I come home with the shot! Mic-Anthony Hay is a member of the Sony Alpha Imaging Collective. Follow all of their adventures on Instagram https://www.instagram.com/micanthonyhay/.